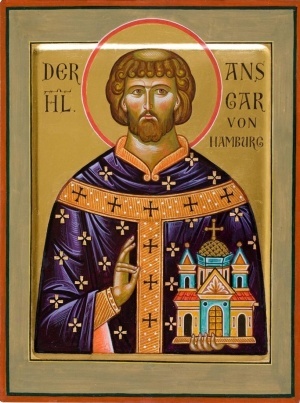 St. Ansgar, Bishop of Hamburg & Bremen. Our father among the saints Ansgar (also Anskar or Oscar), Apostle of the North and Enlightener of Denmark and Sweden, (September 8(? ), 801 – February 3, 865) was archbishop of Hamburg-Bremen. His feast day is celebrated on the date of his repose, February 3. Ansgar was born in Amiens. He had for a period resided with the baptized Danish king Harald Klak, and when Louis the Pious at Worms in 829 was requested by two representatives from Sweden and the Swedish king Björn at Hauge, he appointed Ansgar missionary. The representatives had claimed that the several Swedes were willing to convert to Christianity. Ansgar arrived at Birka in 829, with his aide friar Witmar, and a small congregation was formed in 831, which included the king's own steward Hergeir as the most prominent member. The see of Hamburg was designated a "Mission to bring Christianity to the North," and thus St. Ansgar became known as the Apostle of the North. He died in 865 in Bremen. His hagiography was written by his successor as archbishop, Rimbert of Turholt, in Vita Ansgari. A statue dedicated to him stands in Hamburg, and a stone cross at Birka. "A Brief History of Saint Anskar, Patron of Germany, Archbishop of Hamburg and Bremen (A.D. 865)" Butler's Lives of Patron Saints. Edited by Michael Walsh. Harper & Row, Publishers: San Francisco, 1987. Great Synaxaristes: (Greek) Ὁ Ὅσιος Ἀνσέριος ὁ Ἀπόστολος τῆς Δανίας καὶ τῆς Σκανδιναβίας. 3 Φεβρουαρίου. ΜΕΓΑΣ ΣΥΝΑΞΑΡΙΣΤΗΣ. This page was last edited on July 1, 2013, at 21:12. This page has been accessed 42,347 times.